V o t e d B e s t D a n c e S t u d i o ! C e l e b r a t i n g 3 9 Y e a r s ! See what our students have accomplished on our new YouTube Channel. Each year we end our school year with a dance recital and gym meet. All costumes and gym leotards need to be ordered early to assure shipment and availability in time for photos and spring shows. 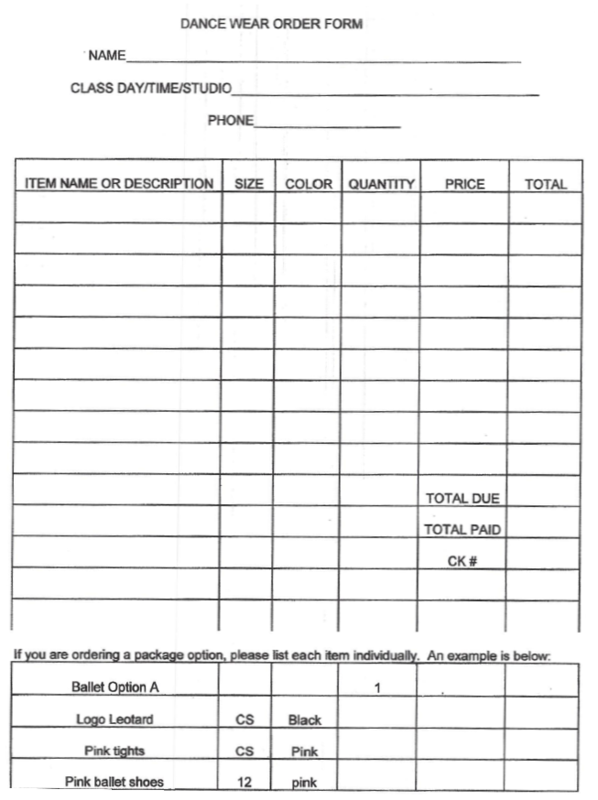 The following is a list of costume prices and payment schedules. All Costume Payments Need To Be Made Seperately From Tuition. If your child is not participating in the dance recital or gym show, please let us know. If you are not participating in the dance recital or gym meet please fill out the form below and return by November 17th. will not be able to be in the recital. will not be able to be in the gym show. July 8 and ends the week of August 5. Sign up using the attached enrollment form. Please provide a $50.00 nonrefundable deposit to hold your space. Cost - $80.00. program. We will apply the $14.00 insurance fee towards the 2019 fall gym insurance. crafts, dance, music, and gymnastics. The cost is $90.00 and includes all crafts and snacks. includes all rehearsals in the fall. from 4:30 p.m. – 7:30 p.m. Cost will be $130.00. There is limited enrollment so sign up early to participate in this wonderful class. CAN AUDITION FOR A CHANCE TO BE A PERFORMER IN THE CHRISTMAS SHOW. TWO CAMPS IN THE SUMMER. COSTUMES ARE GIVEN TO USE. MORE INFO TO FOLLOW. JUNE 8 – BSE AUDITIONS – 10:00 – 2:30 IN STUDIO II – QUAKERTOWN BE PART OF A GREAT FUN FILLED GROUP OF ENTERTAINERS WITH MANY EXCITING TRAVELING OPPORTUNITIES. STUDENTS HAVE PERFORMED IN WILDWOOD, DISNEY, CRUISE SHIPS, NEW YORK CITY, & MANY OTHER PLACES. new modern students wishing to be in a competitive modern class.